Senate Bill 5992, which would ban the sale and possession of trigger modification devices known as bump stocks, was sent to the governor by the Senate, 31-18. Among Spokane area senators, Democrat Andy Billig voted yes; Republicans Mike Baumgartner, Mike Padden, Mark Schoesler and Shelly Short voted no. OLYMPIA – On a day when the Legislature gave final approval to a state ban on bump stocks, Senate Democrats began a push to keep teens from buying “tactical” rifles and provide more security options to schools. On a 31-18 vote Tuesday afternoon, the Senate sent Gov. Jay Inslee a bill that bans the sale or possession of a device to increase the rate of fire of a semi-automatic rifle. It also has a one-year program for the state to pay as much as $150 to buy back bump stocks when they are turned in to the Washington State Patrol. Inslee has said he will sign it. Sen. Mike Padden, R-Spokane Valley, questioned the buy-back program, which was added by the House, saying the devices are relatively easy to manufacture. 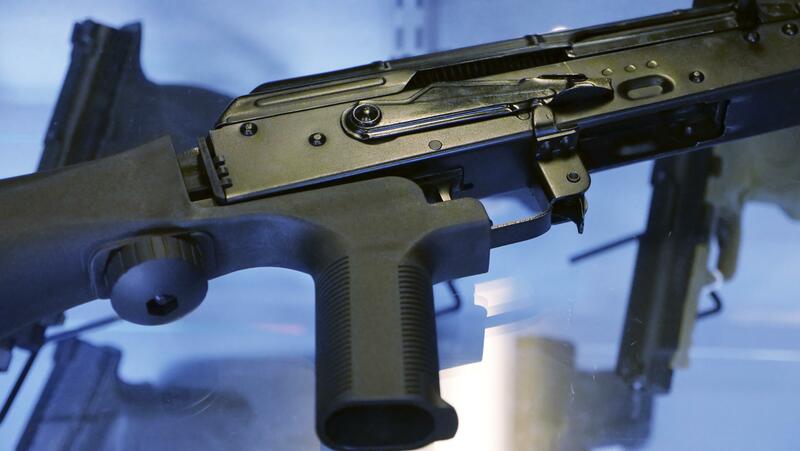 Sen. Mike Baumgartner, R-Spokane, said bump stocks are a national issue and the device was approved by a federal agency now under the direction of President Donald Trump, who has said he’s opposed to them. The Legislature should “take a pause” and see if national restrictions are imposed, he said. “Things travel across state lines,” Baumgartner said, adding individual state laws could create confusion. Earlier in the day, the Senate Ways and Means Committee held a hearing on a separate bill that would put restrictions on the sale of semi-automatic military style rifles, similar to what the state has on handguns. A buyer would have to be at least 21 years old and undergo a more detailed background check. Rifles and shotguns can be sold to persons as young as 18, and have a less extensive background check. It doesn’t use the term assault rifle, which is a bone of contention with gun rights advocates. Instead it calls them tactical rifles, and describes different features that supporters say make the weapons more lethal in mass shootings. Those include a pistol grip, flash suppressor and a folding stock. But opponents argued the Legislature was targeting the nation’s most commonly owned firearms by law-abiding citizens, and have little affect on overall crime. “The folks that would be most heavily affected by this are the ones least likely to do anything bad,” said Brett Bass, a firearms instructor at the Bellevue Gun Club. Other opponents said the restrictions would infringe on the constitutional rights of 18-to-20-year-olds. Some questioned the fast-track process the bill must take to become law before the end of the regular session on March 8. Tom Oster, who described himself as a Marine veteran, called it a “shocking attack” on the Legislature’s public process. The bill was filed Friday, long after the standard deadlines to consider new bills. “Everything about the way this bill’s been brought forward screams it’s a bad faith measure,” Oster said. The bill also contains sections about new systems to improve school security, picking up ideas Republican lawmakers have recently touted. It would require the Office of the Superintendent of Public Instruction to provide money to school districts to set up emergency response systems that could bring quicker law enforcement response. It would also create a Students Protecting Students program that would allow for anonymous reports of potentially dangerous, violent or criminal activities by phone, text or email. The bill calls for that program to be run through the Attorney General’s Office, but Sen. David Frockt, D-Seattle, the bill’s sponsor, said that may be changed to put it under the control of the Washington Association of Sheriffs and Police Chiefs. The bill is not, as some have said, a ban on those weapons, Frockt said, but restrictions on their purchase. Although he doesn’t know yet if he has the votes to pass the bill, since the Parkland, Florida, school shooting where this type of semi-automatic rifle was used, pressure from the public on the Legislature to do something about those weapons has grown, he said. Inslee urged the Legislature last week to place restrictions like those in the bill on the sale of semi-automatic, military-style rifles. Published: Feb. 27, 2018, 5:51 p.m. Updated: Feb. 27, 2018, 10:16 p.m.